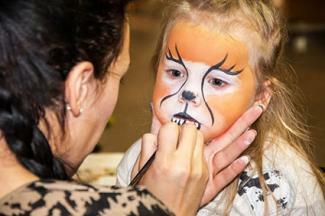 Before getting to the makeup part, work with your child to decide what kind of cat he or she wants to be. Does she want to be a sweet little tabby? Or would she rather be queen of the jungle? It may be helpful to sketch out some ideas to see which is a kid's favorite look. Remember that this is for fun, so the look doesn't have to be exactly like a real cat. Use your imagination and don't limit yourself to certain colors to create the unique cat face a child wants for this occasion. While it may be easy enough to use makeup from Mom's cosmetic bag, you'll probably want to invest in face paints for designing a cat face. Face paints are available in many different colors and are better for wearing over the entire face than regular cosmetics such as eye shadow. When stores' Halloween decorations come out, look for face paint among the décor; you'll usually find quite a selection. Try to buy kits that contain everything you need, including brushes. Otherwise, inexpensive paintbrushes can be used for painting small designs on the face, such as whiskers. 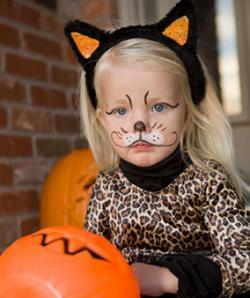 Kids may love to wear cat makeup for Halloween, so choose a look that goes well with their costume. This can range from simple to incredibly elaborate, depending on how skilled and creative you are. For all looks, work the bigger, broad designs first and then focus on small details. Apply dark gray, brown or orange paint around the edges of the face, using a damp sponge to pat it on. Don't blend with the sponge; this may make the makeup streak. Use your dry fingers to blend once the paint is dry. Apply a lighter color, such as white or cream, to the rest of the face, using fingers to blend it into the deeper colors. Create "fur" with even strokes of gray or brown. Begin between the brows and paint several strokes directed upward. Paint strokes from the outer corners of the eyes and below the lips. Paint on a nose in an upside-down triangle shape in black or pink. Use a skinny brush to make whiskers leading from the nose in gray or white. Follow steps one and two above to create your background canvas. Outline eyes in a cat-shape. Because this look is created on kids, be careful when applying makeup close to the eyes. Keep the makeup under the bottom lid and above the top lid; do not apply directly on the eyelids. Use black or another deep color for outlining. Use small brushes to paint on fur, using several different colors to create depth and shadow to make the look more realistic. Practice on the back of your hand to perfect your technique. These strokes should be short and slightly overlap each other. Begin from the center of the face and work your way outward. Paint on a nose in black and bring a line down the center to the upper lip. Paint lips in black, curving a line upward past the outer corners of the top lip. Dot a few black points between the nose and mouth on both sides. 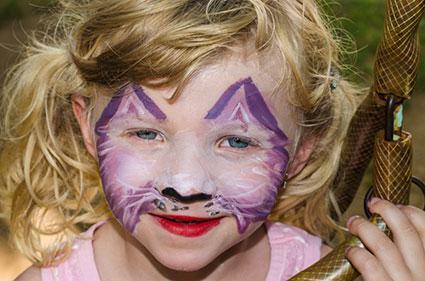 For an enjoyable cat look, make sure you use face paints that are listed as non-toxic and easy to remove. Keep cosmetics away from the eyes. Cat face makeup ideas for kids have no limits, so use your imagination and all your creative skills to design kitty faces that are sure to be the cat's meow!